For the past three months, I have been promoting Jumia products on my blog via affiliate marketing and it has really been an amazing and profitable partnership. Lately, I decided to expand my blog income channel to Konga affiliate marketing by replicating the same blogging strategies I learn't - pick a top selling product, write a product review on them and place an affiliate links at the end of each product post that direct potential buyers to the product sales page. 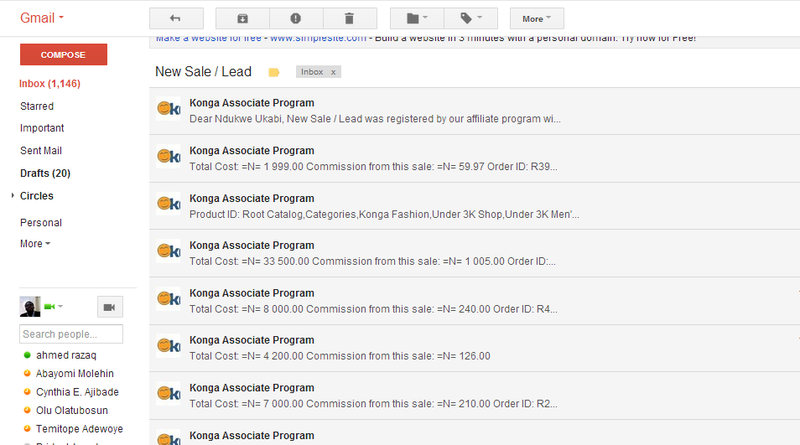 For those of you that may be asking what Konga affiliate marketing is about. It is a win-win partnership initiatives that pays bloggers when they promote and sell any or prefered Konga products online. Tip: The earnings above is a snapshot of commission payable on sales made in 7 days. The earnings look small but you should note that I started my Jumia affiliate marketing like this before it grew to what it is today. There is a formula for internet affiliate market business which when applied correctly will produce the same result anywhere anytime. Affiliate marketing is the most profitable internet business you can start with zero capital and make money from day one if you do your homework very well.